While you were vacationing on New Year's Day, nearly two million worms were working hard at Charlotte Douglas International Airport. The airport installed them in the fall of 2012 as part of its new recycling center. 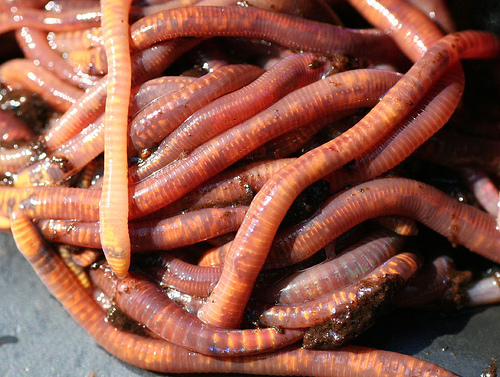 By munching through passengers' coffee grounds, used paper towels, and uneaten French fries, the worms are making garden fertilizer out of what used to be landfill fodder. At the recycling center, employees first sort through the airport's 25 daily tons of trash. Recyclables such as cardboard, aluminum, and plastic are sold. (One airline, project director Bob Lucas said in November, discards entire sleeves of plastic cups even if only a few were used during a flight.) Clothing, which Lucas said panicked passengers dump in the trash when their bags are overweight, is collected by a "group of ladies" who clean and donate it. As for the worm food itself, it gets heated and pre-composted before finally going to the red wigglers. The airport plans to use waste from the worms to fertilize its grounds. The slimy new employees are happy and—now that Lucas has figured out how to stop them fleeing during a thunderstorm—seem to plan on staying at their jobs. Image: Sparrows' Friend (via Flickr). Thanks to Leigh for the tip!